*Disclosure- This post is brought to you by AdvertiseWithBloggers.com and Essentially Coconut. I received the mentioned product courtesy of the sponsor for the purpose of this review. All opinions are genuine, based on my experience with the product and have not been influenced by promotional items. Up until about a month ago, I had never heard of coconut butter. I have used coconut oil for some time, but the butter had eluded me. I wondered if there was much of a difference between the two, and come to find out, there is! Coconut butter is made from the whole meat of the coconut, while the oil is pressed out of the meat. Coconut oil turns liquid when melted, but the coconut butter turns into a smooth, creamy consistency. After more research, I am finding that many health fanatics consider coconut butter a superfood. Why? Coconut butter is so versatile too! It's amazing how many different ways you can incorporate it into your recipes! Use it as a spread, drizzled over fruit, added to smoothies, mix into oatmeal, add to curries and soups, sauté shrimp or scallops, use in baking, or my personal favorite- Eat it straight from the jar! I recently received some coconut butters from Essentially Coconut to try. As soon as I opened the shipping box, I was overwhelmed with an amazing scent of sweet goodness. I opened the jars to get a feel for what exactly this coconut butter is. It was packed tightly in the jar, and upon using a spoon to scoop it out, I found it a bit crumbly. So, I popped the jar into the microwave for 20 seconds to soften it up a bit, then my spoon slid right in. As soon as the spoon passed my lips, it was love at first bite, leaving me wondering "where have you been all my life!?" I started wondering what kind of recipe I could make with it, which led me to Pinterest and Google for inspiration. I was only coming up with Paleo recipes, but since I don't follow that diet, the recipes sounded a bit complex, calling for ingredients I don't keep on hand. So, I improvised with what I did have in the pantry and came up with these super tasty and addicting 3 Layer Coconut Butter Cups. Lightly spray 12 paper muffin cups with cooking spray. Break chocolate into pieces, and melt in a double broiler, or on the stove in a metal bowl placed over simmering water. Spoon 1 tablespoon into bottom of baking cups. Place in refrigerator to set, about 5 minutes. Meanwhile, in a food processor or blender, pulse graham crackers into fine crumbs. Melt butter; stir into graham crumbs until they are moist. Place 1 tablespoon graham mixture over set chocolate, gently pressing down with fingers to pack it tight. Place coconut butter in a medium bowl. Microwave for 20 seconds, or until butter is soft. Place coconut oil in a separate bowl, and microwave 30 seconds, or until completely melted. Whisk into the softened coconut butter, until completely combined. Pour 1 tablespoon over graham crumbs. Return to refrigerator to set, about 20 minutes. Top with slivered almonds, chocolate chips, or other chopped nuts if desired. Essentially Coconut Coconut Butter is currently available to purchase in 12 ounce jars, for $12 each. If you would like to learn more about Essentially Coconut Butters, be sure to visit www.essentiallycoconut.com. One lucky Theresa's Mixed Nuts reader is going to win Essentially Coconut! Winner will receive (1) 12 ounce jar of Honey Pecan, (1) 12 ounce jar Sweet Almond, and (1) 4 ounce jar Original. Have you eaten coconut butter before? Which flavor would you most like to try? I would like to try Honey Pecan first. such exquisite delight! They look like my peanut and chocolate cups or baskets over at Facebook :) They're so easy to make! Oh man. We have peanut allergies in our home. But maybe I could make these for an adult only event! I think these would make a great addition to any adult party table! Robin, you have got to try it! 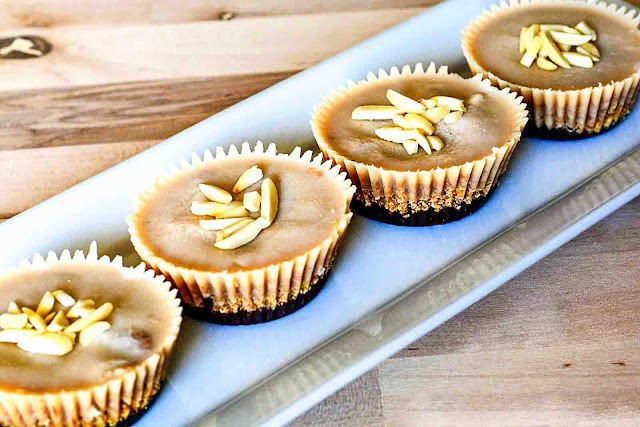 You have a sweet tooth like I do, I know you will love it! I haven't heard of it until now. As usual though, you're snacks turned out oh so cute!! I bet they're tasty too. Yummy! These look good! I haven't heard of this product before, but it looks like it would be something I'd like! I want to try the Creamy Cashew Coconut Butter because cashews are my favorite nut (and nut butter). I am already imagining all of the yummy treats I can bake with these - cookies, brownies, and more! Oh my! These cups look delicious! I would definitely top mine with a few chocolate chips. I think the sweet almond butter looks delicious. By the way, I LOVE your pictures. I just got back from our grocery store and unfortunately they don't carry this one. Will have to enter to win and get some! I have never tried coconut butter before. I think the sweet almond sounds yummy! I have never heard of coconut butter but it sounds delicious! I really would like to try it--perhaps first right out of the jar --then on a sandwich along with some jelly! My daughter would love these coconut butters! She'd like the coconut butter cups even more. I love how creamy they look. I am going to try the recipe, thanks! 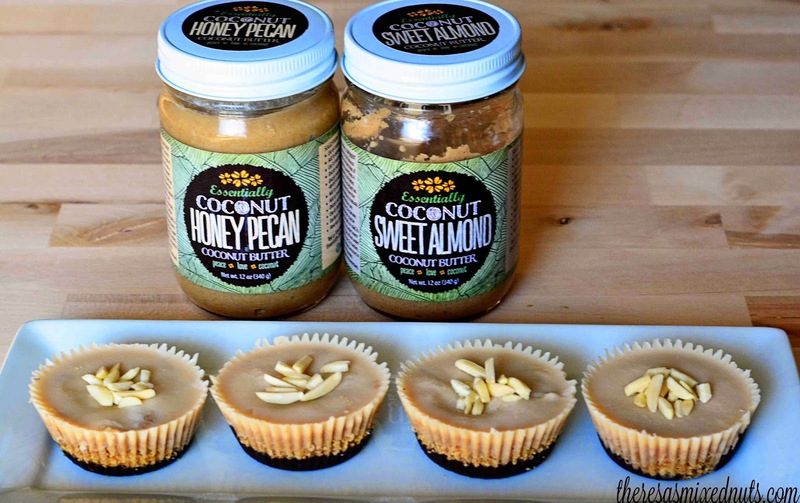 I would love to try Coconut Sweet Almond Coconut Butter. I love both coconuts and almonds and would love to bake with it! I would love to try them all! Your recipe looks absolutely divine! The honey pecan flavour sounds amazing! I would love that Honey Pecan Coconut butter. I can imagine using it in baking but also on something like roasted Brussels sprouts. Any of these would be great of course, but I am a huge pecan fan, so I would try that first. Oh my! These look super tasty! I hadn't ever heard of coconut better before. I bet it's so good! I need to try this! OMG I'd love to try all their products. I think I'd dive into: Creamy Cashew Coconut Butter first. Oh my, all of the flavors sound fantastic that it's hard to decide which one I most want to try. Honey Pecan coconut butter is a really unique flavor, so it gets my vote. I'm a recent coconut butter addict, I use it on everything: sweet potatoes, fruit, oatmeal, carrots, over jam on rice cakes...I'd really love to win this giveaway! My lucky day. I got a jar of the honey pecan during Christmas. Didn't know what to do with it... until now!! I've been thinking to micro 2-3 spoonfuls, drizzle on vanilla ice cream. But all I need is the coconut oil and I can bake your recipe. Ooh, and Valentine's is Saturday. Maybe a red cherry on top!! These look really great. I have been meaning to incorporate more coconut oil into my family's diet and this would be a sweet way of doing so. Ok, this is something I'll have to do. I love everything coconut, and that it's 'no bake', won me over for sure! Oh these look so amazing! I love it and hope I win! They all sound good! I would like to try the Creamy Cashew Coconut Butter. The Creamy Cashew butter sounds amazing!!! We are big fans of cashews in my home, so I know this would go over splendidly! You're as informative as you are a master baker and creative guru. I didn't know about coconut butter, either. You've given me any good reasons to try using it, though. Thank you, Theresa. I have never heard of coconut butter before. 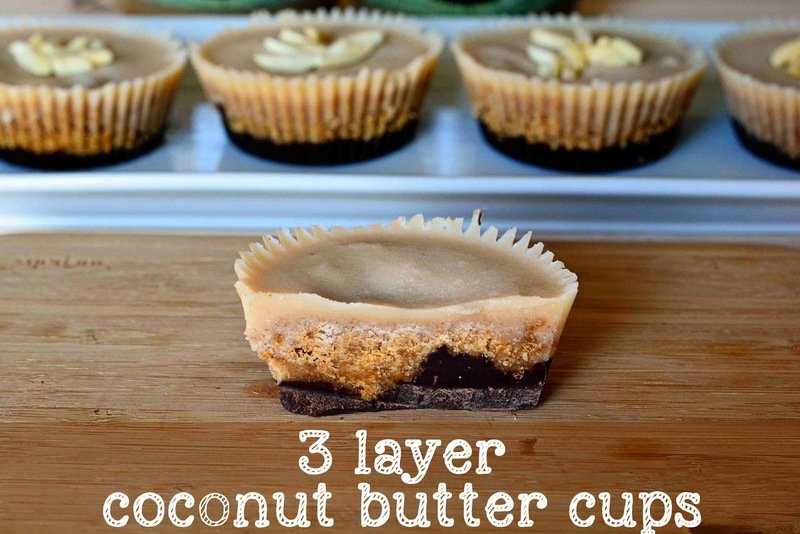 However, after seeing your recipe for 3 layer coconut butter cups, I want to try it. I would love to try the pecan or the cashew flavors. That sounds awesome! Wow! These look so amazing! I would love to try the honey-pecan! Just sounds delicious! This recipe is awesome! These sound pretty good! Thanks for sharing this recipe. YUMMY. This is totally new to me. I will be looking to see if we can get this in Canada! Happy Valentines Day Theresa! Honey Pecan sounds so good! OMG the Honey Pecan sounds divine! Honey pecan sounds amazing but I love all things coconut!! I dont think I've had coconut butter before but it looks tasty. I'll have to look for this in my area so I can try this recipe. I'd love to try the Essentially Coconut Honey pecan coconut butter. Sounds delicious! I would love to try the Sweet Almond Coconut Butter on toast. I would love to try the Sweet Almond Coconut Butter on some biscuits.